Reduce clutter and waste with Blue Avocado’s reusable storage bags. 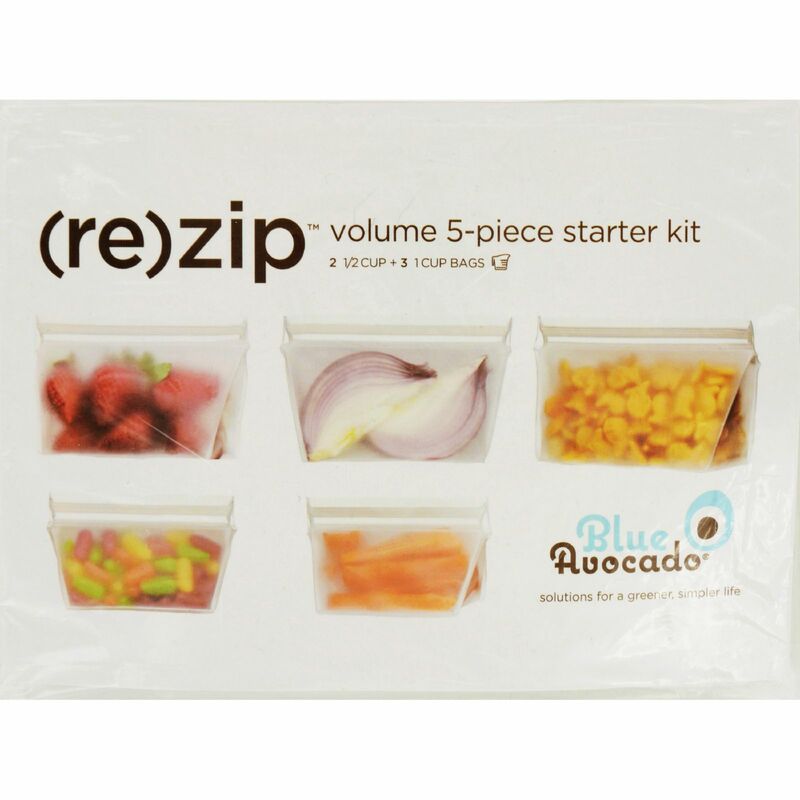 The 5 piece (re)zip volume starter kit includes 3 one cup and 2 half cup sizes. Use them to replace plastic baggies used for snacks, sandwiches, travel, home organization and more. (re)zips are made out of food safe, fda-grade peva material, and are pvc-free, lead-free & bpa-free. (re)zips are safe to use in the freezer and the leakproof double-lock closure seals in freshness. Ideal for use at home or on the go. These durable, lightweight bags can be used for snacks, sandwiches, travel, home organization and more. Use them on-the-go for healthy lunches and snacks, or for bulk grocery items without having to change containers at home. The transparent design allows for a quick glance at contents inside, and the double-lock closure provides an airtight seal. (re)zip stand-up bags have an expandable base for easy filling and cleaning. Blue Avocado’s mission is to simplify our lives with thoughtful design. We know that every small thing we can do to live more simply and mindfully will have huge effects on not only in our lives, but also in our communities at large. Life doesn’t have to be complicated. We make it easy and efficient to organize the thing in your home, at work and everywhere in between. We know it’s hard to be “green,” and we’re on the journey together. We know a little bit goes a long way and we do our part by helping you do yours. We are committed to giving you the products and tools that help you simplify and de-clutter your life. Inspiration is everywhere. We love learning about the ways people use our products as creative solutions in the way they live, work and play. We want to preserve our planet as we simplify your life. We use recycled materials, create re-usable products and complete the cycle with a unique take-back program. Since 2013, BlueAvocado has been a certified B Corp, designated for our ability to meet rigorous standards of social and environmental performance, accountability and transparency. Starting right with upcycled materials. Since 2009, we’ve partnered with Repreve® to turn more than 5 million plastic bottles into BlueAvocado products.